A Global Hawk UAV flies over Edwards Air Force Base in California. These aircraft performed about 5 percent of the surveillance missions in Operation Iraqi Freedom, but collected 55 percent of the data on sensitive targets. As the sun sets over Baghdad, automatic-weapon fire erupts from a concrete building's third-story window. Flying gentle circles above the new hot spot, an unmanned aerial vehicle shoots detailed video of the situation. Through the growing darkness, coalition forces on the ground view video of the sniper and another group of insurgents. In seconds, it's determined that a Bradley fighting vehicle, with support from a Black Hawk helicopter, is needed to handle the situation. As the forces converge on the scene, they are aided by live video from the unmanned plane. So are commanders, miles away. The scenario described by contractors is just one of countless instances where technology is being used on the frontlines. Information gathering and sharing are the essence of network-centric warfare: getting data to the warfighters who need it, when they need it. And a key method for gathering that data is with unmanned aerial vehicles. Global Hawk UAVs from Northrop Grumman Corp. performed about 5 percent of the surveillance missions during Operation Iraqi Freedom, but the vehicles were responsible for collecting about 55 percent of the information on time-sensitive targets, according to an Air Force report. "That's how it's going to be from now on," said Shai Shammai consulting manager for aerospace and defense at market research firm Frost & Sullivan of New York. "In Iraq and Afghanistan, UAVs already have proven themselves to deliver real-time intelligence, surveillance and reconnaissance at a level of capability unheard of or unseen before." The development of technology to manage that data and ensure connectivity is sure to be a major growth area of IT spending over the next decade, Shammai said. UAV spending worldwide likely will double over the next decade to $4.5 billion annually, totaling more than $30 billion, according to a study released in June by aerospace and defense consultancy Teal Group Corp., Fairfax, Va. The U.S. military likely will lead that spending, Teal Group officials said. "U.S. UAV efforts are closely tied to the broader trend in information warfare and net-centric systems," a Teal Group report said. "UAVs are a key element in the intelligence, surveillance and reconnaissance portion of this revolution, and are expanding into other missions as well, with the advent of hunter-killer UAVs and other types of combat UAVs." Systems integrator DataPath Inc., Duluth, Ga., is one company focused on network-centric warfare and the role UAVs play in that, said Andy Mullins, the company's chief executive officer. DataPath supplies rugged satellite/Earth terminal solutions that support military network-centric communications. The company, which ranks 95 on Washington Technology's 2005 Top 100, recently signed a $17.5 million to provide the Army Communications-Electronics Command with 14 joint network, node-satellite communications trailers and 38 satellite communications battalion command-post node trailers. DataPath also supplied Earth terminals for a Marine Corps Systems Command communications project in Iraq. "Everybody in the world is talking about net-centric operations, and it's a great buzzword. But what this project really was about was for the Marines to apply directly all that net-centric infrastructure to solve real-time problems for soldiers on the front line," Mullins said. The solution incorporates the Boeing Scan Eagle UAVs that have 12-hour flight durations, as well as the Marine Corps' Pioneer UAVs. The effort is called the Video Storage Wide Area Network project. "It's about pushing the edge of that net-centric network, not only to the frontline soldier but also to the sensors deployed beyond that soldier, so he or she can understand with some specificity what obstacles are in front of them," Mullins said. The solution also offers recording, editing and storage capabilities that let warfighters use the data any time. Analysts can use the video for post-action reviews to see what was done correctly or incorrectly. Capt. David Joseforsky, a Marine Corps Systems Command project officer in Iraq, said the network is operating in Iraq with five systems deployed throughout the areas of operation. "What we're doing is using them to stream live video and also to push large imagery files over a satellite communications network that basically parallels our tactical network, so we don't have to bog down our communications," Joseforsky said. The system takes the video feeds from UAVs and digitizes and compresses the images. It then sends them to LANs established on the ground and from which multiple users can access the video and data. Even using the compression algorithms, bandwidth becomes a major issue for UAVs and network-centric warfare, Joseforsky said. The independent satellite communication system the Marines use addresses the issue, but bandwidth will need new technology in the future. "A lot of our communications and data links are from 128K up to about 4MB, which isn't a whole lot when you're servicing 20,000-plus people," Joseforsky said. "In the streaming video, we're pushing around a 400-Kbps stream, so once we start pushing multiple streams, it starts adding up pretty quickly and eats away at our connectivity." Bandwidth technology is a prime opportunity for technology companies, Shammai said. "UAVs are consumers of bandwidth," he said. "You need to manage different frequencies, and there are ways to deal with it. Technology that will allow the bandwidth that was once used to control a single UAV to control 10 UAVs is what's needed." There's also a need for technology that ensures networks stay operational, Mullins said. As military forces depend on data from UAVs, the network becomes as important as weapons. Solutions that are flexible and easy to use in battlefield situations are also important. In the case of the Marine network project, the systems were up and running quickly. "We've really taken the best of the commercial technology and use it on the battlefield," Joseforsky said. "It's a huge leap for us at Marine Corps Systems Command to procure the equipment, have DataPath integrate it and get it ready for us in 60 days." Air traffic management is another area that IT companies will need to watch. Shammai recalled an incident in Afghanistan in which a passenger aircraft almost collided with a German UAV. That near miss highlighted the need for air traffic management. Another need is for a master control that can manage various UAVs as well as unmanned boats and land vehicles. Raytheon Co. is developing a tactical control system for the Navy that simultaneously will manage multiple UAVs. It works with Northrop Grumman's RQ-8 Fire Scout helicopter UAV. "One of the major focuses we started out with was to build an architecture to fly more than one UAV," said Gerald Bazemore, Raytheon's director of unmanned ground systems. "So we have a [version] now that will support dissimilar air vehicles." Typically, UAV builders would develop controls specific to just one vehicle. That led to stovepiped, ground-control systems that can't interoperate. That issue needs to be addressed to achieve the battlefield-view snapshot that network-centric warfare promises. "The only way you're really going to accomplish that is by linking all those systems together in some manner," Bazemore said. Look for unmanned combat aerial vehicles to be another of the biggest growth areas over the next 10 years to 20 years. Northrop Grumman's X-47 Pegasus is the kind of combat vehicle likely to attract spending. The X-47 focuses on three missions: surveillance and reconnaissance, suppressing enemy air defenses, and strikes. The vehicle also has stealth features. "The new combat vehicles will start mainly as bombers, but they will gradually replace fighter aircraft," Shammai said. "I see UAVs climbing the procurement list and gradually taking more of the budget from manned aircraft." Civilian uses for UAVs, such as boarder patrol, fire fighting and communications, also are expected to grow quickly. AeroVironment Inc., Monrovia, Calif., is developing the Global Observer, a plane that can fly for more than a week at an elevation of more than 65,000 feet. It can be used for communications in civilian applications, as well as for a range of military applications. "One of the highest payoff missions for that type of plane would be as a communication relay in a battle area [over] a couple hundred mile radius," said Bob Curtin, an AeroVironment vice president. "We would use this, in essence, as a geostationary satellite flying at low altitude." The evolution of UAVs will depend on developing smaller and lighter systems, said Mike Andrews, L-3 Communications Inc.'s chief technology officer. 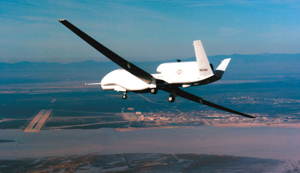 L-3 provides communications and sensor systems for UAVs. In June, company officials announced an agreement to acquire Titan Corp., an information and communications systems solutions provider. And in January, L-3 acquired BAI Aerosystems Inc., which designs, manufactures and integrates UAVs. Weight diminishes the endurance and flight time of the vehicles, so the push to make UAV components lighter will continue. Even without the advances that are on the horizon, for Joseforsky the realization of network-centric warfare has begun. "This is the beginning of it. This system is all IP-based, it's very simple to set up," Joseforsky said. It eliminates the limitations of terrain and lets "us push it anywhere in the theater. We could realistically push back to [the continental United States.]. I really think it is the starting point of net-centric warfare."